Los Angeles hosted its Women’s March for the third consecutive year on Jan. 19. This event not only celebrates the advancement of women’s rights but also reminds us of how far our society still has to go. The Women’s March, which originally started as a response to Donald Trump’s election, encompasses the intersectionality of feminism. Activists for Black Lives Matter, immigrant’s rights, environmental conservation, and the LGBTQ community have joined this march to demand justice for all women. Although the event officially starts at 8:30 a.m., the Women’s March started earlier for many train-goers. Even as early as 6:30 a.m., many participants arrived at various Metro stations with handmade posters, shirts, and accessories, creating an ambiance of excitement. In Pershing Square, the official Women’s March began with a Tongva Nation Blessing in honor of the missing Indigenous women. It continued to include a broad array of speakers and performers. Each shared their own empowering perspectives and called for women to take the initiative in the classroom, workplace, home, and in society. Many speakers drew from recent news stories like Brett Kavanaugh, the Flint water crisis, and the mid-term elections just to name a few. But one topic mentioned by nearly every speaker was their support for the LAUSD teachers’ strike. Each time the strike was mentioned, it drew loud applause and agreement from the crowd as participants proudly waved their “We Support the Teachers” posters. Not all of the featured speakers were presenting a speech. In fact, some delivered an equally powerful message through song and dance. Singer and empowering songwriter Raja Kumari enraptured the audience through her blend of Indian music with hip hop. You can find the song she performed, “Shook,” on YouTube, iTunes, and Spotify. Another unique form of art was unveiled by sculptor Kristen Visbal as she called upon women to be as fearless as the girl in her statue, “Fearless Girl.” Although only 50 inches in height, the “Fearless Girl” represents the boundless determination and power inside of each young girl or woman. As marchers completed their trek, the front of City Hall filled with people eager for food trucks and (much-needed) restrooms. Here, the event continued with even more speakers spreading words of empowerment and inspiration. With the Women’s March officially concluding at 2 p.m., the crowd eventually dissolved and gradually returned home, eager to enact change in their own social spheres. 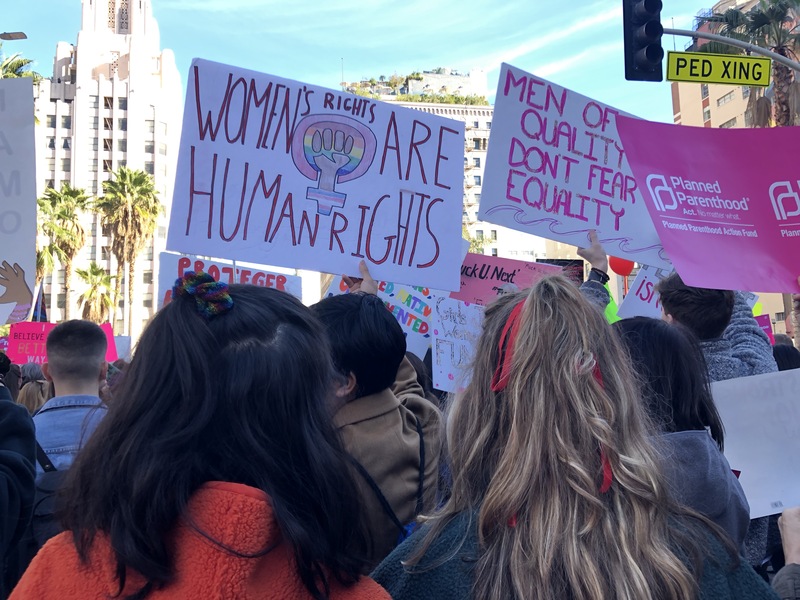 Although the LA Women’s March 2019 is over, social activism doesn’t end along with it. As many of the speakers urged us to do, it is our responsibility to educate and inspire those around us, whether that be spreading awareness at school by creating a club, donating to organizations, or even participating in future marches. And may this march be a reminder of the accomplishments of women and what can be accomplished when we all come together.